Patmos has been an important part of my life since 1988 when we first visited - it is a magic and healing place and we return as often as we can. It is worth the 48 hour journey from S.W. Cornwall to the holy island of Patmos in the Aegean Sea! We stay in the same hotel and follow the same patterns. 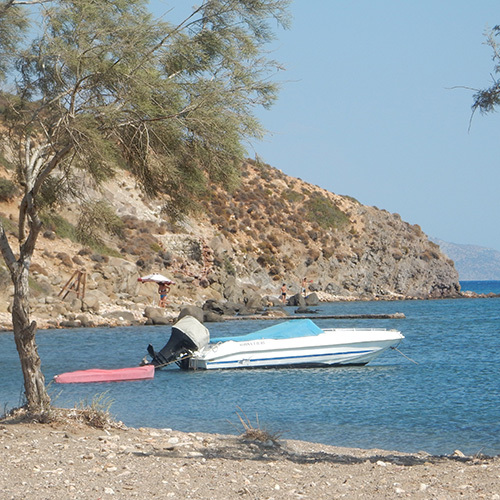 Our first eccentricity is to walk to the beach at Agriolivado just over 4 kilometres away. 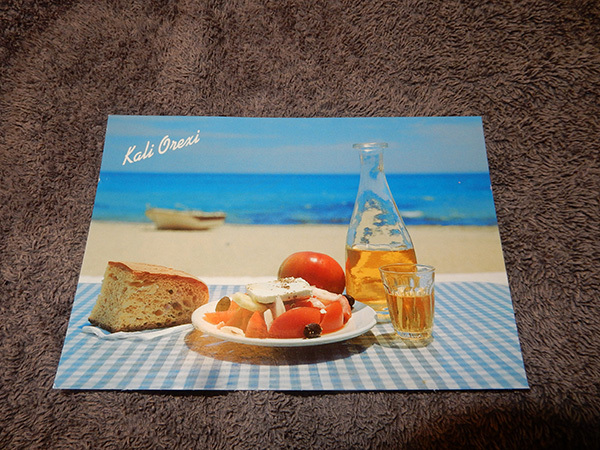 There we rest under the same tamarisk trees, have the same lunch in the same taverna, now run by the great nephew of the man we first met selling grapes from the verandah of his home in 1988. The evenings are spent eating at family-run tavernas we have come to favour - now run by the children we have watched growing up. Time passes, patterns of living stay much the same. The monastery at Hora dominates the island in both a physical and spiritual sense. It is one of the most important sites in the Greek Orthodox Church. Its influence does seem to impact on my thoughts and the sense I make of my life. This year we returned with a gift from the owner of the hotel where we stay - a painting of the view from the hotel up to Hora and the monastery. This simple piece was part of a series that used to hang in the hotel before its revamp. This year (2016) I did wonder what impact Patmos would have on my textile art. As usual I took plenty of photographs – these can often inspire the creative process. 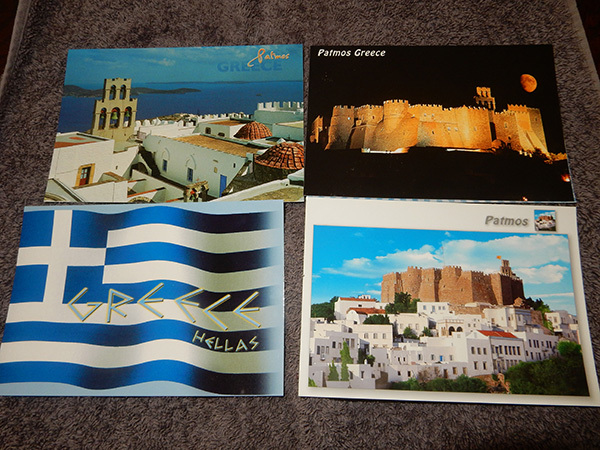 And I bought postcards of the view up to Hora and the monastery. As I think back I realize that part of my creative process is collecting and remembering images – my photography plays a significant role in my textile work. This process is then moved on by some specific event such as the March for the Alternative, or by particular people who inspire me or whose marriage I want to commemorate in a wedding quilt. 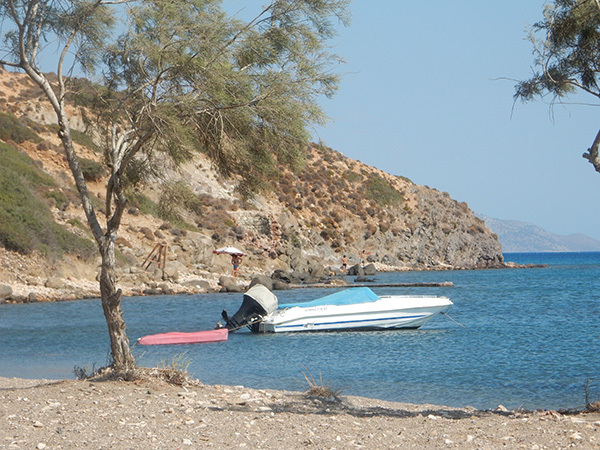 The series I have just started work on has been inspired by Patmos and is titled PATMOS – AN INSPIRATION. There is now the possibility of an exhibition in the Cultural Centre in Skala, the main town in Patmos, next September (2017).